In Rick Marcum’s new novel, a college professor grapples with his past when one of his favorite students is attacked. Alex Lohr is a dedicated English professor at the Santa Fe campus of St. John’s College. Few of his current associates know of the ruthless business career that preceded his academic life, or of the troubled relationships in his past — until one of those relationships surfaces when Edwin Teba, one of Alex’s favorite students, is beaten into a coma by unknown assailants. Edwin’s uncle, Mike Deerinwater, was a college friend of Alex’s. The two haven’t spoken in decades, not since badly injuring an opposing player during a football game. Although wary at first, Alex and Mike resume their friendship and set out to find Edwin’s attackers. Edwin was the protégé of scientist Sol Ginsberg, who recently gave a controversial talk about the potential of artificial intelligence – and died soon after, possibly of unnatural causes. Alex finds that there are many parties who may have taken an unhealthy interest in Ginsburg’s work, and thus in Edwin. West Texas Crude has a compelling and complex protagonist in Alex—a man with myriad and realistically incongruous feelings and experiences. Marcum also excels at rendering the multicultural society of Santa Fe. The narrative, however, sometimes falters. Anecdotes are told more than once, and dialogue sometimes feels forced or goes on a bit too long. Perhaps more importantly, the sudden revelation near story’s end of who is behind Edwin’s assault feels rushed, and that character’s motivation seems simplistic and unbelievable. Both elements are especially jarring given the nuance that characterizes the rest of the novel. 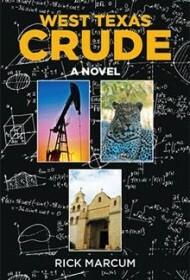 West Texas Crude has a great deal going for it, and may entertain readers despite its flaws. A bit of polishing and a more fully developed solution to the mystery, however, would put it in the league of James Magnuson’s wryly powerful works of Southwest noir.